The ocean evokes in mankind both love and fear. In equal parts. And for many the fear inhibits the act of love. This love and fear goes back millennia. If you look at a list of ancient Greek goddesses and gods of the sea there are plenty, ranging from the primordial gods Oceanus and Tethysare, the father and mother of Homer’s gods, to Poseidon and a whole lot of nymphs and monsters. All cultures have ocean deities. Life came from the oceans, and the oceans cover 70% of our blue Earth. We all love the seas and the beaches and feel replenished after time spent on or near the water. Yet how many of us would dare jump off a boat miles off shore? Who would swim out to sea in the middle of the night? Who besides watermen, divers and surfers would jump into big waves and dive into deep water, to inhabit for maybe a minute the world of the undersea? My birthday is on a famous day in Brazil, the day of Lemanjá, the Afro-Brazilian mother goddess of the sea. On the second day of February she is said to rise out of the waters. She is worshipped by all and especially those who venture out to sea: fishermen and sailors. I have always loved being in the water and my mother tells me stories of me jumping into the waves as a baby. My grandfather lived on the sea in a small New England fishing town and all year he would jump into the cold sea and frolic like a big brown seal. Often I would be be right beside him, the two of us floating on our backs and laughing at the ridiculously icy water. But despite my affinity for water and my rather reckless nature of jumping into every body of water I come cross I too have always felt that pull of fear, or rather that vice like grip of the ocean depths that seems in our minds to want to pull us down and down. Like there is something in the deep that wants to envelop us in a world where we cannot possibly survive, an inkiness with no air and a silence broken only by the bubbles leaking out of us and slowly depriving us of life. I felt this most strongly in the clear blue water that I love the most, the south pacific ocean surrounding the volcanic island of Moorea. Every day for close to a year I swam out from my little bungalow on the lagoon, into warm shallow waters populated by friendly sea turtles, my local reef sharks (seriously harmless fish who poke around all day looking for who knows what) and hundreds of small colorful creatures flickering in the sun dappled waters. Next to my lagoon was one of the Moorea’s two bays, Oponohu, a big gash connecting the green volcanic cliffs to the incredibly deep waters of the ocean just several hundred meters beyond. The gash runs deep and sometimes I swam across Opunohu towards the pass to venture out to sea. The edge of lagoon and bay and ocean is a careening precipice curving downwards to the ocean floor some thousands of meters below. That edge so visible in the gin-clear waters makes swimming out feel like you are willingly launching yourself off the edge of the Grand Canyon. Once out past the reef, with my world’s bottom no longer visible, where the huge and gentle swell makes me feel less like a falling object and more like a space voyager I would regain my calm breathing. It is not the simply the depth that made me shut my eyes to thwart the terror but that pull of the deep so much more powerful than than anything I have ever felt. In most places I swim the water is not so clear and the ocean floor not so precipitous so that feeling rarely rises up. This is just one aspect of our fear of the ocean. There are others. Yet our love is just as powerful. It’s pull just as thrilling. Most people want to go to the beach, to the seaside on their time off. The sound of waves is soothing. The ocean air is bracing. Only on the beach is it acceptable everywhere to be scantily clad, to expose most of our skin, to be vulnerable. And as much as I love all bodies of water the ocean with its salty water feels the best. You float better, it leaves your skin smooth. And it is the oceans that are home to dolphins and whales, those almost human creatures with large brains, and funny smirks and complex languages that always seem to welcome us to their world. If only we could go there. Many if not most of us balance this love and fear by simply dipping our toes into the water, literally. We frolic in shallow water, we boat on top off the water, and we sometimes windsurf and jet ski and wake board our way across the surface of the ocean. This is equivalent to a bird jumping up and down. Its fun and if all your friends are doing it its even more fun. But it is not an experience of the sky. It is not our lot to be able to fly into the sky, but we have innate abilities to swim and dive. To do so we must gain confidence, swallow our trepidation and allow ourselves to float and swim happily. It is a practice, like yoga, like playing the violin. Confidence is not innate, something you have or not have. It is not reserved solely for experts and for heroes. Lack of confidence is also not innate, reserved solely for you and me. It is something that you learn and acquire and practice. I practice by swimming as much as I can, almost every day. Sometimes straight out to sea, towards the other side of the ocean and then I stop and listen and see in a way that you see stars at night lying down in nature. You see vastness and that vastness makes you fly. It is a great feeling. The only aching sadness is the realization that while the ocean welcomes us we will never truly inhabit it. The Lost City lies in the Sierra Nevada Range, a geographically isolated range that reaches 5700 M and is one of the world’s highest coastal ranges. It has steep jungles and rushing rivers and is sparsely populated. In 1972 a stone ‘city’ on top of a ridge was ‘discovered’ by looters and then excavated by a team of archaeologists. The local Indians, descendants of the Tayrona, claimed to have known about it all long but wisely kept quiet about it. Between 1976 and 1982 it was studied and excavated and many of the trees and growth covering the stone steps and buildings were removed. However it was not to be a popular site as by the late 1980’s and all through the 1990’s the entire region was considered too dangerous to visit. As late as 2003 a group if tourist were kidnapped on their way by foot to the lost city. I’ve followed and read Quora for years. Some great answers to all sorts of questions. I finally answered a question. You get published immediately! I’m going to keep at it. In October of 2013 I went back to Tahiti to visit my friends. It was austral spring and the time when humpback whales relax in the safe waters off the Tahitian islands. Mothers come with their calves, a pairing that reminds me of a jumbo carrying the space shuttle. Males come alone but create an alluring ambiance with their singing. The whale watching boat I was on had waterproof microphones which we hung over the sides to pick up the singing. Under the canopy there were a couple of waterproof speakers, good ones so the sounds were clear and full. While we scanned the glassy rolling water for signs of breaching whales, a mile off the eastern coast of Moorea, we listened to the echo-y sounds which I couldn’t really tell if they were very low or very high. They just seemed to come in pulses and made me feel strange, queasy almost, as I strained to hear better, to somehow understand what was surely a language? Where were they? Even just a mile off shore the depths here were well over 1,000 meters and plunging fast to several thousand more meters. So much water; so much depth; so much space for these vast creatures. A three dimensional world to our two dimensions. After a few minutes we saw bubbles and and then some hundred meters away a geyser of water and air. A mother and her calf coming up to breath. About eight of us donned masks and snorkels and slid overboard. I swam away from the boat and looked down into the increasing blackness of the ocean. The sky was cloudy; very different conditions from when I swam across from Tahiti to Moorea, not too far from where I was now. Then it was sunny and my memory of the water was shafts of sunlight going down, lighting an ocean that started off crystal clear and became crystal dark, black that was still blue that vanished into nothing, no color. Today it was cloudy and the water seemed even more massive. When I saw the whale it was just a dark mass, maybe 50 meters below the surface…maybe more? It was hard to tell. Stationary. I swam directly over the whale and held my breath, trying to breath quietly and as little as I could, gently treading the still water with my hands. I had to blink to keep the darkness in my view, just an oval outline a little blacker than the water. Then the mass moved and a smaller shape rose up, the calf coming straight up like a a huge rising buoy. Towards me! Directly towards me. Very soon I saw fins and shapeliness and then eyes and a long snout that reminded me both of bird and dog. And it came straight to me. I slowly backed up, staring intently as the calf grew larger, rising and floating upwards. It finally breached and as it exhaled it turned to position its eye in front of my face. I saw in the eye no recognition, no warmth yet no coldness; I sensed a certain tracking of me. And then the flipper rose up and slapped the surface, just in front of me, hard enough to send a wave of water over my head, but never touching me. Then the calf went back down, to its mother who still lay suspended and unmoving below. I was told that babies breath every ten minutes and mothers every twenty. No longer afraid I swam directly overhead. Any trepidation about being in the water so close to such a powerful animal had been replaced by a giddy desire to belong to the whales, to enter their world, to enter a world alien to me yet right here. Fear comes with the knowing a bit at least of what is in store. This was something new. No knowledge of what was in store. And then the dark shape moved almost as if I had willed it to rise towards me. By now the other swimmers were close to me and my own private portal to these two whales shut down, replaced by dual awareness of my fellow swimmers, our guide telling us to move back and of course the mother whale rising up, taking on features just like the baby did, only so much bigger. She breached close, and rolled sending walls of water over us. We had knowledge of her awareness of us, if only because nothing she did put us in danger. Other swimmers took pictures and broke the stillness with exclamations. Maybe to keep the fear at bay. After seeing a second breach by both mother and calf we swam back to our boat, our little floating capsule that while on the water felt not a part of it at all. We motored back to the pass, replacing ocean with first the sights of Moorea, that most perfect of Islands, and her sounds of waves rising up to split apart on the reef and then the smells of earth and people. The rest of that day I was a little bit not present, still back there in the ocean thinking about the whales. When it got dark and knowing how utterly dark the ocean depths would be to me I could only wonder what our whales were doing. In 4 days, April 15, 2018. 17 km swim in a river, which doesn’t really look like a river. Looks more like a flooded river and apparently is the main reservoir that waters Sao Paulo. The closest town is called Nazare Paulista and the river/reservoir is called the Atibainha. I found out yesterday that the race will allow use of wetsuits. That is not good news for me as I will not wear one. My old one is well, old, and my new one will scar me and give me a rash from the rubber seams. I’ve done 5 swim of comparable distance. Two 12 Mile Key West races, Tahiti to Moorea (18 km), Straits of Gibraltar (17 km) and Sardinia to Corsica (15 km). I can usually swim at a pace of 3500-3750 meters per hour for long distance swims so that gives me a projected time for this race of 4.5 to 5 hours. All of my swims however were done in salt water. My longest lake swim was Lausanne to Evian across Lake Leman which is 11 kms. I remember that as a hard swim. The lessened buoyancy really takes its toll. Also for me at least fresh water seems more corrosive to my sinuses. After a long lake swim I feel like I’ve injected acid up my nose. Never feel that in the ocean. Yesterday I swam 6.5 kms current neutral (up and down the same beach) in 1:50. A little over 3500 MPH. I invited my new friend Grasiela who swam the 4 km Bahia Norte last weekend, on April 7. She is a strong swimmer and placed top 10 overall in the race. But she hasn’t swum much on her own on the ocean. We left together yesterday morning and made a plan to meet two hours later back at the life guard post near my house. So we were both on our own. I love swimming on my own. Not only do you go exactly at the pace you want to go but you feel much more a part of the ocean. When you swim offshore, even as little as 50 meters, or 200 which is the normal distance I swim off shore when I swim parallel remember that only your forehead and eyes are above the water level…just a few inches. So the world you see is water and sky. The world you hear is the rustling, slapping. jostling of water rushing by your ears, capped or uncapped, and the world you feel is temperature, swell, and the thick supportive buoyancy of the water. It is at once expansive and tiny. I love to swim with a friend who pushes me, or sometimes I can push him. That experience is a shared one and depending on relative strength can lead to a faster swim. I do not have my friend Serbo here in Brazil so I usually swim alone. Grasiela swam very well and she wants to go again..alone! 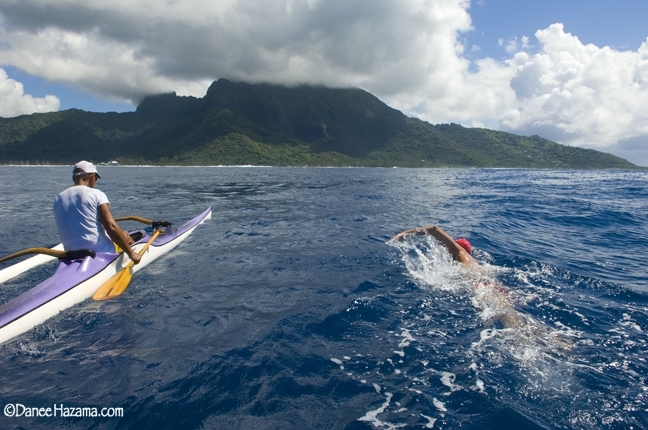 I encourage all swimmers to swim out to sea…straight out 500 meters,1 km, more! There is nothing out there to bother you. I always feel slightly nervous when I swim straight out. But that nervousness that you want to feel, that keeps you going back for more. Back to my river/lake swim in 4 days. Last night I spoke with my kayaker Diego. The race organization paired me up with him. He is an experienced kayaker and has races Tahitian outrigger canoes. I told him that his primary job is navigate from start to turn around point and back to the finish using the shortest possible line. His secondary job is to be aware as best he can about other swimmers and to relay information to me about gaing/passing on swimmers as after all this is a race. I told him that I would always swim along side so if he needs me to veer one way or the other I will simply follow his lead. Feeding should be simple. Alert me every 30 minutes and throw me out a bottle of my powerade and water or a gel pack or a banana if I asked for one. There are some 50 plus swimmers registered. Several are Brazilian record holders and top competitors. I look forward to the race! So, I named my blog Surfing Hippo.